Situated at an altitude of 1815 mts, Pithoragarh, the main town of the district of the same name, sits in a small valley that has been called “Little Kashmir”. Rich in natural beauty and dotted with lakes and glaciers, the Pithoragarh district, in the northern part of the Kumaon region, is home to a rich variety of flora and fauna. This picturesque district is also the gateway to the Holy Manasrovar Lake, a highly revered spot among the Hindus. Air: Nearest airport Naini Saini(5 km). 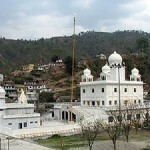 Reetha Sahib: The Sikh shrine is located near Lohaghat. It is associated with the visit of Guru Nanak. It is believed that the bitter ritha turned sweet after the touch of the Guru. Chandak: 7 km from Pithoragarh, is a beautiful location, commanding a panoramic view of the Pithoragarh valley. It is 1.830 meters in altitude. An important fair is held at the Mostmanu temple in August. Rameshwarghat: The Shiva temple is located 36 km from Pithoragarh, at the confluence of Ramganga and Sarju rivers is held in great reverence. Thal Kedar: 16 km, from Pithoragarh is an important religious center and also noted for its natural beauty. A large fair is held on Shivratri. 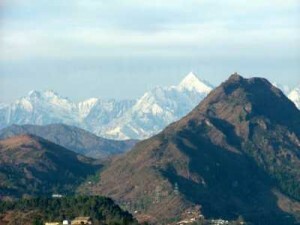 Dhwaj, 28 km from Pithoragarh, commands a wide view of the majestic snow-peaks of the north. It is also important for temples devoted to Lord Shiva and Maa Jayanti. Manu temple: The white temple is truly a worth visit. In it, is enshrined a powerful goddess known to bring rain to these mountains if properly invoked. There is also a large swing erected on the field at the base of a flight of steps leading to the temple. Here the goddess and her sister from a distant temple swing playfully when the other goddess comes visiting. No one can see them, but the swing moves. Purnagiri: Located 20 kilometers away from Tanakpur is truly a worth visit. Perhaps, the most important religious center on Pithoragarh, Purnagiri temple, devoted to Maa Purnagiri. It is believed to lead to fulfillment of one’s desires. This entry was posted in Pithoragarh, Uttaranchal and tagged Little Kashmir, Reetha Sahib, Ritha Sahib. Bookmark the permalink.